Pancakes, waffles, doughnuts are all going sour on us. Little Goat had a problem. Not a problem, really—more of an opportunity. It was about the sourdough starter. The bakery next door, Little Goat Bread, had so much—how could the diner put it to more use? The solution: Like many other restaurants at the moment, Little Goat added sourdough to its breakfast dishes. 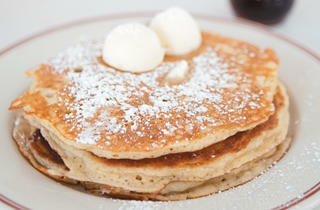 It started with pancakes (pictured), which is where many chefs seem to start. 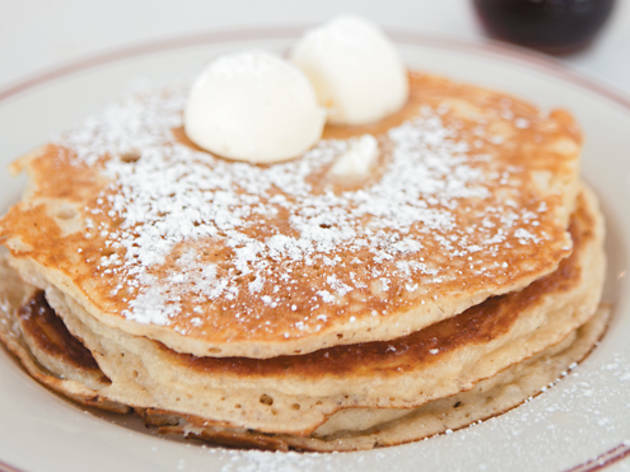 Heather Terhune of Sable Kitchen & Bar also uses sourdough starter in her pancakes to lighten them (she says housemade ricotta and blueberry compote harmonize with sourdough’s characteristic tang). At Three Aces, Matt Troost focuses not on pancakes but waffles: He likes how the characteristic sourness of his sourdough waffles counteracts the sweetness of bananas-Foster rum sauce. Over at Acadia, they’re serving sourdough doughnuts for brunch (which starts April 28). It’s pastry chef Thomas Raquel’s way of making use of a starter he initially made for a bread (which has since been taken off the menu). And speaking of bread, Matt Sussman, managing partner of Table, Donkey and Stick, is churning out sourdough-leavened pretzels, buckwheat baguettes and sunflower-oat bread. “Most people in America think of sourdough bread as the San Francisco style with a very pronounced sour presence, but naturally leavened breads don’t have to be like that,” he says. Sussman also seems to be the lone voice claiming it doesn’t have to be served in the morning.